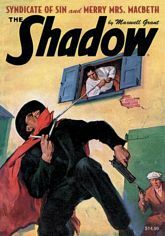 The Knight of Darkness proves that "crime does not pay" in classic pulp thrillers by Theodore Tinsley and Walter B. Gibson writing as "Maxwell Grant." First, only The Shadow knows that stolen Nazi art treasures are being peddled in America by a murderous "Syndicate of Sin." Then, death comes hurtling onto the stage of "Merry Mrs. MacBeth," a new Broadway musical. BONUS: A Golden Age of Comics Nick Carter adventure illustrated by Bob Powell! BONUS: Carrie Cashin investigates the mystery of the "White Elephant" in her first adventure by Theodore Tinsley. This instant collector's item showcases the classic color pulp covers by George Rozen and Modest Stein, original interior illustrations by Paul Orban, and historical commentary by Will Murray.